The goal of iodine-131 therapy for pediatric Graves' disease is to induce hypothyroidism. However, changes in post-treatment thyroid volume have not been investigated in pediatric and/or adolescent patients. The aim of this retrospective study was to examine whether changes in thyroid volume predict post-treatment hypothyroidism in adolescent Graves' disease patients. We used ultrasonography to examine changes in thyroid volume, and also assessed thyroid functions, at 0, 1, 3, 5, 8 and 12 months after iodine-131 treatment in 49 adolescents ranging in age from 12 to 19 years retrospectively. Based on thyroid function outcome at 12 months, patients were divided into two groups: 29 patients with overt hypothyroidism requiring levothyroxine replacement and 20 without overt hypothyroidism. 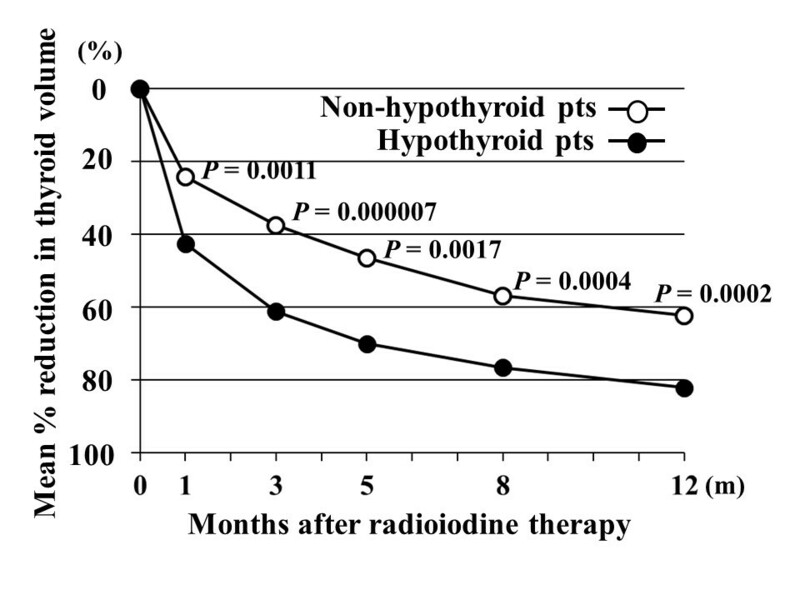 We compared changes in post-radioiodine thyroid volume between the two groups. About 90% of patients whose thyroid volume at 3 months after iodine-131 administration was less than 50% of the original volume were hypothyroid by one year after treatment (positive predictive value 88%, sensitivity 75.9%, specificity 85.0%). We believe ultrasonographic measurement of thyroid volume at 3 months after iodine-131 to be clinically useful for predicting post-treatment hypothyroidism in adolescent Graves' disease patients. Graves' disease (GD) is the most common cause of hyperthyroidism in children, adolescents and adults [1–3]. Treatments available for GD include anti-thyroid medications (methimazole or propylthiouracil), surgery and radioactive iodine (RAI) [4, 5]. There is ongoing debate worldwide regarding the most suitable therapy for GD in pediatric patients. Although anti-thyroid medications are commonly used as first-line therapy for pediatric GD, long-term remission occurs in only 20% to 30% of pubertal cases and 15% of pre-pubertal cases treated pharmacologically [3, 6–8]. Consequently, either surgery or RAI is needed to achieve a long-term cure in most pediatric GD patients. RAI therapy is generally considered to be safe, inexpensive and effective, with relatively few side effects [8–10]. Radioiodine was introduced for the treatment of GD more than 50 years ago , and at present is the most commonly used treatment for adult GD in the North America . In 107 young GD patients who had been treated with RAI before age 20 years, no increased risk of adverse events was reported . In some facilities, RAI is becoming the first-line therapy for GD in children and adolescents [14, 15]. The goal of iodine-131 therapy for pediatric GD is to induce hypothyroidism [16, 17]. When children are treated with 330 μCi/g of iodine-131, hypothyroidism is achieved in nearly 95% of patients . Higher dose ablative therapy (13.8 to 15.6 mCi) is effective in nearly all children with GD . The use of high dose iodine-131 will destroy most thyroid tissue, thereby decreasing the risk of RAI-induced thyroid tumors, and is thus preferable especially in children . The long-term risks of thyroid cancer appear to be lower when the thyroid gland is largely ablated than when residual thyroid tissue remains [21, 22]. Changes in post-RAI thyroid volume have been investigated in adult GD patients [10, 23–26], but not in pediatric and/or adolescent patients . The objective of this retrospective study was to investigate changes in post-radioiodine thyroid volume in adolescent GD patients (< 20 years old) and also to examine whether these changes predict post-treatment hypothyroidism. The medical records of all adolescent patients (< 20 years old) at Tajiri Thyroid Clinic who received a single RAI treatment for GD during the decade from January 2000 to January 2010 were examined retrospectively. The present study was approved by the Institutional Review Board of our clinic. GD was diagnosed based on elevated free thyroxine and suppressed thyrotropin concentrations, elevated TSH receptor antibodies (TRAb), and diffuse, elevated uptake of radioiodine or technetium-99 m within the thyroid. Thyrotropin, free thyroxine and TSH receptor antibody were measured by electrochemiluminescence immunoassay (Cobas e601; Roche Diagnostics, Tokyo, Japan). The iodine-131-absorbed radiation dose was calculated from RAIU and thyroid weight, using the formula: dose (μCi/g) = oral iodine-131 dose (mCi) × estimated 24 h RAIU (%) × 10/thyroid weight (g). Twenty-four hour RAI uptake was estimated using 4-hour uptake of iodine-123  or 20-minute uptake of technetium-99 m . Thyroid volume was estimated by ultrasound (SSA-350A; Toshiba Inc. Ltd., Tokyo, Japan) as previously reported . Thyroid function (free thyroxine and thyrotropin) and ultrasonographic thyroid volume were determined at 1, 3, 5, 8 and 12 months after RAI therapy. When free thyroxine values dropped below 0.8 ng/dL and/or thyrotropin levels rose above 20 μIU/mL, replacement therapy with levothyroxine was initiated. Statistical analyses were performed using Student's t test and the chi-squared test. Values are shown as means ± standard deviation (SD). A P-value of less than 0.05 was considered to indicate a statistically significant difference. There were 10 males and 39 females ranging in age from 12 to 19 years (mean ± SD, 16.4 ± 1.8 years old). All 49 patients were initially treated with anti-thyroid medications for 1 to 108 months (80% with methimazole, 20% with propylthiouracil). RAI therapy was performed due to lack of remission after 14 to 108 months (39%) of medical treatment, the development of a presumed toxic reaction to anti-thyroid drugs (44%; rash, arthralgia, hepatitis, neutropenia), or a desire for definitive therapy (17%). Anti-thyroid drugs were discontinued 3 to 5 days before RAI treatment. After administration of iodine-131, patients were treated with anti-thyroid drugs with or without propranolol to control symptoms of hyperthyroidism until hyperthyroxinemia abated. The mean RAI dose for our 49 patients was 184 ± 84 μCi/g (range 44 - 393 μCi/g) and mean thyroid volume decreased significantly from 34.5 ml to 8.3 ml during the one year period after RAI (P < 0.00001). Based on thyroid functions at one year after RAI, patients were divided into two groups: 29 (59.2%) with overt hypothyroidism (hypothyroid patients) requiring levothyroxine replacement therapy (mean time until hypothyroidism: 4 ± 1.5 months, range 1 - 8 months) and 20 (40.8%) without hypothyroidism (non-hypothyroid patients) taking no medication at one year after RAI. The 20 non-hypothyroid patients consisted of 8 euthyroid and 12 hyperthyroid patients. Euthyroid patients included two who experienced transient hypothyroidism at 3 months after I-131 but had recovered without intervention at 1 year and one with subclinical hypothyroidism (TSH 6.53 μIU/ml (normal range: 0.20 - 3.30 μIU/ml)) at 1 year. Hyperthyroidism was subclinical in 8 patients and mild in 4 with serum free T4 levels of 1.93 - 2.03 ng/dl (normal range: 0.90 - 1.80 ng/dl). None of the hyperthyroid patients took anti-thyroid drugs at one year after RAI because all were asymptomatic. There were no statistically significant differences between euthyroid and hyperthyroid patients with respect to pre- and post-treatment thyroid volumes, or in percent volume reductions at 1, 3, 5, 8 and 12 months. The characteristics of adolescent GD patients who received RAI therapy, divided into hypothyroid and non-hypothyroid groups, are summarized in Table 1. There were no significant differences between the two groups in gender (P = 0.20), age (P = 0.18), pre-treatment thyroid volume (P = 0.30) or pre-treatment TRAb values measured by cosmic TRAb coated-tube kit (P = 0.45). The two groups differed only in the RAI dose administered (P = 0.048). NS: not significant. All values are means ± SD. We compared changes in post-RAI administration thyroid volume during the one year period after treatment between hypothyroid and non-hypothyroid patients. As shown in Figure 1, post-treatment thyroid volume was significantly smaller in hypothyroid than in non-hypothyroid patients, especially after 8 months (8.2 ml vs. 13.1 ml at 8 months; P = 0.003, 6.3 ml vs. 10.9 ml at 12 months; P = 0.0005). The mean percent reduction in thyroid volume was significantly greater in hypothyroid than in non-hypothyroid patients at all measurement time points (P < 0.005) (Figure 2). We examined whether changes in thyroid volume predict post-treatment hypothyroidism at one year. The optimal cut-off point for predicting post-treatment hypothyroidism is considered to be a 50% reduction, as compared to the original volume of the thyroid gland, at 3 months after iodine-131 administration (Table 2). The sensitivity, specificity, positive predictive value, negative predictive value, positive likelihood ratio, and negative likelihood ratio were 75.9%, 85.0%, 88.0%, 70.8%, 5.1 and 0.3, respectively. Changes in thyroid volume during the one year period after iodine-131 therapy in hypothyroid and non-hypothyroid patients. Mean thyroid volumes in hypothyroid vs. non-hypothyroid patients were 36.3 ml vs. 31.9 ml at 0 months (m), 20.3 ml vs. 23.2 ml at 1 m, 13.6 ml vs. 18.8 ml at 3 m, 10.9 ml vs. 14.8 ml at 5 m, 8.2 ml vs. 13.1 ml at 8 m, and 6.3 ml vs. 10.9 ml at 12 m after iodine-131 therapy. Percent reductions in thyroid volume during the one year period after iodine-131 therapy in hypothyroid and non-hypothyroid patients. Mean percent reductions in thyroid volume in hypothyroid vs. non-hypothyroid patients were 42.6% vs. 24.2% at 1 month (m), 61.2% vs. 37.6% at 3 m, 70.1% vs. 46.5% at 5 m, 76.6% vs. 56.9% at 8 m, and 82.2% vs. 62.4% at 12 m after iodine-131 therapy. We also examined the relationship between iodine-131 doses and post-RAI administration thyroid volume at 3 months in all 49 patients. Three iodine-131 doses (mean ± SD) were compared: 120 ± 32 μCi/g (n = 25, range 44 - 171 μCi/g), 200 ± 20 μCi/g (n = 11, range 174 - 224 μCi/g) and 300 ± 62 μCi/g (n = 13, range 225 - 393 μCi/g). When doses of 120 μCi/g, 200 μCi/g and 300 μCi/g were used, post-RAI administration thyroid volumes at 3 months were less than 50% of the pre-treatment thyroid volume in 36% (9/25), 55% (6/11) and 85% (11/13) of patients, respectively. We also found that doses of 120 μCi/g, 200 μCi/g and 300 μCi/g resulted in hypothyroidism at 1 year after RAI in 48% (12/25), 55% (6/11) and 85% (11/13) of the patients, respectively. This retrospective study showed mean post-treatment thyroid volume to be significantly decreased, from 34.5 ml to 8.3 ml (P < 0.00001), at one year after RAI in 49 adolescent GD patients (age range: 12 - 19 years), as has been demonstrated in adult GD patients (10,23-26). The goal of iodine-131 therapy for pediatric GD is to ablate the thyroid gland, in order to decrease the risk of RAI-induced thyroid tumors . However, changes in post- RAI administration thyroid volume have not been investigated in pediatric and/or adolescent patients . We found thyroid volume at one year after RAI administration for adolescent Graves' hyperthyroidism to be significantly smaller in hypothyroid than in non-hypothyroid patients (mean 6.3 ml vs. 10.9 ml; P < 0.001). As the post- RAI administration thyroid volume is smaller in hypothyroid patients, apparently conferring a lower risk of thyroid neoplasm development, this underscores the need for hypothyroidism to be a goal of therapy when using iodine-131 to treat GD in children . A correlation between changes in thyroid volume and thyroid function outcome in adult patients with GD has been described (10,23-25). However, these studies did not investigate the relationship between the degree of thyroid volume reduction and thyroid function outcome. Chiovato et al reported that the degree of thyroid volume reduction after RAI administration was the best predictor of early (within 1 year) thyroid function outcome in adult Graves' hyperthyroidism . In fact, we found that about 90% of our patients had become hypothyroid at one year when thyroid volume was less than 50% of the original volume at 3 months after iodine-131 administration (positive predictive value 88%, sensitivity 75.9%, specificity 85.0%). We also found that 85% of patients treated with a dose of 300 μCi/g (range: 225 - 393 μCi/g) showed remarkable thyroid gland shrinkage (< 50% of the original thyroid gland volume at 3 months) and 85% were hypothyroid at one year. These data indicate that doses of approximately 300 μCi/g are needed to insure ablation of thyroid tissue. Our findings are thus consistent with those reported by Rivkees et al . High thyroid-stimulating antibody levels before iodine-131 seem to be associated with a relative resistance to therapy (24, 26). On the other hand, TRAb levels did not show any predictive value for iodine-131 therapeutic outcome . In our present study, pre-treatment TRAb values were not correlated with iodine-131 therapeutic outcome. 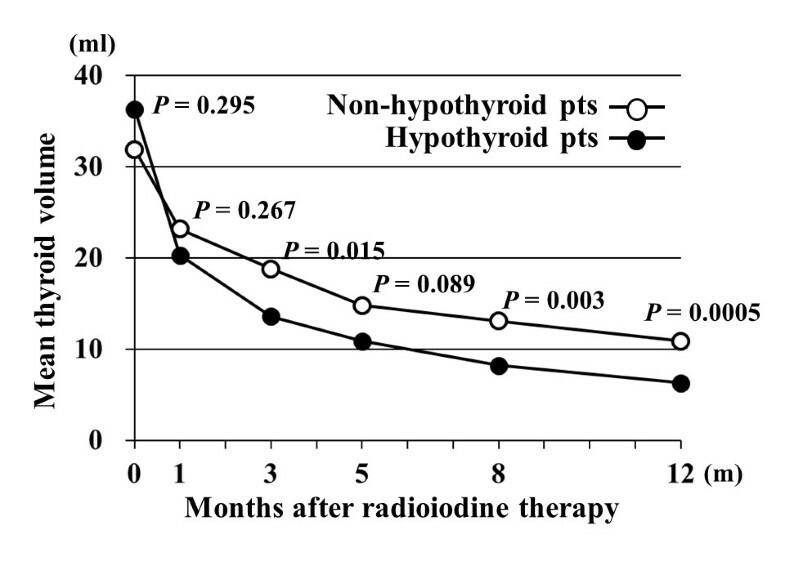 In conclusion, thyroid volume progressively diminished for one year after iodine-131 administration for adolescent GD. Decreases were more significant in hypothyroid than in non-hypothyroid patients. We also demonstrated that approximately 90% of patients became hypothyroid within one year when thyroid volume was less than 50% of the original volume at 3 months after RAI therapy. We believe ultrasonographic thyroid volume measurement at 3 months after iodine-131 administration to be clinically useful for predicting post-treatment hypothyroidism. All authors contributed to the development and writing of this manuscript and each has many years of clinical experience in the care of individuals with Graves' disease. All authors read and approved the final manuscript.